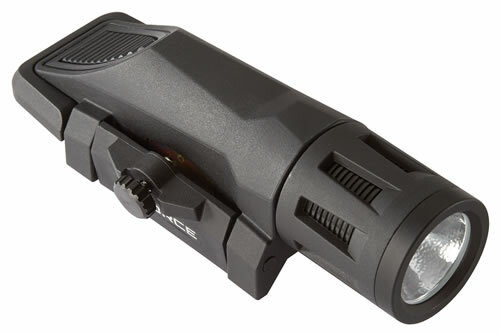 Inforce's WML White/IR Gen2 light is ultra-compact, durable and offers three operating modes: constant, momentary and strobe. With just a flip of the lever, instantaneously switch between white or infrared. The high efficiency emitters provide up to 1.5 hours of runtime in white mode and 4 hours in infrared mode. The high-intensity beam fills your field of view for close to mid-range target identification. The integrated clamping design allows for seamless MIL-STD-1913 mounting on your weapon with no tools. Its easy-to-operate lockout mode ensures the light isn't turned on until you're ready. The WML White/IR Gen2 has an output of 400 lumens in white mode and 100mW in infrared mode, and includes one Lithium CR123A battery.This model has a black finish.